Only a few weeks after his 21st birthday, and almost two years before he established himself as a consistent and dangerous goal-kicking rover with the Navy Blues, Stewart ‘Stewie’ McLatchie was decorated for conspicuous bravery under fire during World War 1. A farmer from Sale in south-eastern Victoria, McLatchie joined the thousands of young (and some not so young) Australians who volunteered for military service when war was declared in August 1914. He left Australia for France in November 1915, and within six months was in action with the Australian 13th Field Artillery Brigade. This driver set a fine example on the afternoon of 31 August 1917, whilst accompanying an ammunition train of filled ammunition wagons to the ammunition dump at Potizje, east of Ypres. The column suddenly came under a burst of accurate hostile fire, causing casualties amongst personnel, and 15 horses. Driver McLatchie displayed a disregard for personal danger in removing our wounded to cover and dressing their wounds. He then assisted Driver C.E.Wright in the re-organisation of the column, thereby displaying courage and devotion to duty deserving of special recognition. On the night of 1 October, 1917, Driver McLatchie was one of a party engaged in carrying ammunition to his battery with pack horses. At the time, the battery was in action east of Westhoek. The battery positions and roads in the area were being heavily shelled by enemy 5.9” howitzers, and 8” guns. By his coolness, courage, and cheerful devotion to duty, Driver McLatchie inspired the remainder of the party working with him, and by assuming the part of NCO, was largely responsible for getting five trips delivered at a time when there was a shortage of ammunition at the guns, and it was most urgent that the supply should be increased. His devotion to duty is deserving of special recognition. This time, however, McLatchie was merely Mentioned In Despatches – a pat on the head in comparison to the Military Medal. One can only assume that the Army High Command officers who approved the award must have assumed that everyone should be cheerful and calm while working out in the open under a rain of high-explosive shells! Happily, Stewie survived the horrors of that awful conflict, and returned to his hometown of Sale in south-eastern Victoria in early 1919. Prior to the war he had been a promising junior footballer with Sale, and had pulled on his boots at every opportunity during his time in uniform. It is thought that someone with links to the Carlton Football Club had been impressed with his play in army matches, and so invited him to Princes Park. 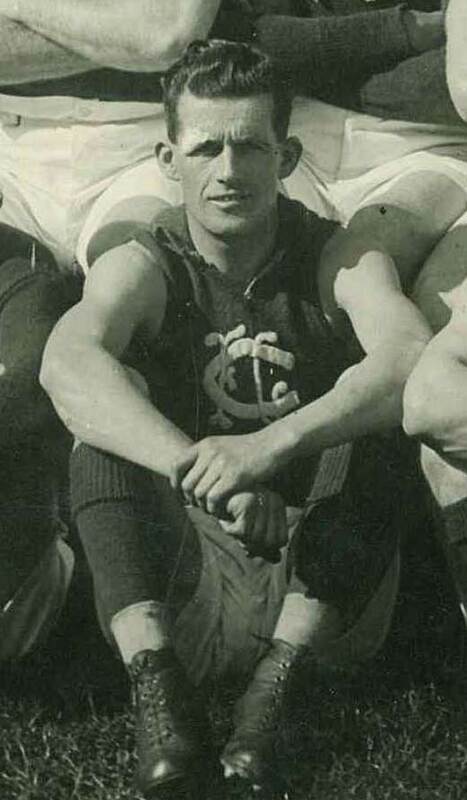 In a rapid transition, McLatchie was fast-tracked into the Blues senior squad, and made his senior debut against Geelong at Corio Oval in round 13, 1919. Playing as first rover, he kicked a goal, and was sharp around the packs all afternoon as the Blues swamped the Pivotonians in the last quarter and won by six goals. Stewie didn’t play again that year, but when he returned in 1920 he was a revelation. Quick and skilful, often dynamic, and always courageous, he became an automatic selection for the Blues in a career that included finals appearances in three of his six seasons. He and follower-forward Bert Boromeo were Carlton’s best players in the Blues’ heart-breaking loss to Richmond in the 1921 Grand Final, and McLatchie went on to wear the Big Vee in representative games for Victoria on five occasions. Sadly, by 1924 Carlton’s morale had ebbed as the team languished on the lower rungs of the 9-team VFL ladder. Under senior coach Percy Parratt, McLatchie lost his coveted first rover position to ex-Fitzroy star Harold Carter early in the year, but was still appointed vice-captain when Horrie Clover resigned mid-season. Stalwart defender Paddy O'Brien then assumed the captaincy. None of this made a scrap of difference to the dismal Blues however, and by August, Stewie had had enough. He played his last game for Carlton against the team he had faced in his first - Geelong – at Princes Park in round 17, 1924. Sharing the roving duties with Carter, he kicked a trademark opportunist goal as the Blues upset the woefully inaccurate visitors by 7 points; 9.7 (61) to 6.18. (54) and Stewie at least bowed out a winner. McLatchie was only 28 years old when he crossed to Fitzroy in 1925, but he didn’t settle at Brunswick St and managed only four games and four goals in a brief stay. Later that same season, he joined VFA front-runners Brunswick, and his ability was finally rewarded with a Premiership when the Magpies beat Port Melbourne by 16 points in that year’s Grand Final. Playing in the centre, McLatchie dominated the game and was widely regarded as Best on Ground. In later years, McLatchie and his wife Myrtle lived at Caulfield. In 1939, when Australia was drawn into another major conflict at the outbreak of World War II, Stewie answered the call to arms again. This time, he drove trucks instead of horses, as he served for three years with a General Transport Company in mainland Australia. Starting as a Private, he was promoted through the ranks to Sergeant by war’s end, and probably held his fellow volunteers enthralled on many occasions with his accounts of carting live ammunition by horseback through barrages of shell-fire in the earlier Great War. McLatchie was eventually discharged by a grateful country for a second time in October, 1945. He lived out his days of hard-won peace, and passed away at the age of 71 in January, 1968. Contributors to this page: PatsFitztrick , Jarusa , molsey , Bombasheldon , tmd1 , p(12)terg , dgreen2 and admin . Page last modified on Tuesday 15 of January, 2013 22:07:02 AEDT by PatsFitztrick.